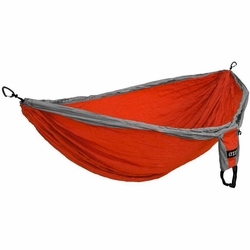 ENO Double Deluxe Hammock. Eagles Nest Outfitters. Sure, you could hog the whole Double Deluxe and feel like the King or Queen of your own country, but what good is a party bus with no party? Invite a friend, stretch out, and laugh together at all the people sitting in the dirt like suckers. The added width of the Double Deluxe makes it the perfect option for some quality time for you and your favorite St. Bernard. Unfolded dimensions	(L x W) 9' 4" x 8' 4"